I Heart Guitar: No Plans is a pretty diverse album. It goes through a lot of different moods. Was that the plan? Ian Moss: I guess it’s hard to be objective. I was kind of hoping it’d seem like more of a unified record, so it’s interesting to hear that there are lots of different styles. I guess over and above, we were trying to achieve raw power. Well the title track, which starts the album, definitely does that. It kicks off very strongly. Yeah! The distinctive tones of Barnes. The first thing you hear is Barnes. And hopefully that edge. Because there were really no overdubs. We went for it. We’re all in it together here and we played til we got it right. That gave it a bit of oomph. Check out this beast! 28″ scale length, 24 – yes, 24 – frets, silverburst finish, Gibson 496R and 500T ceramic pickups. These are gonna be huge. Not that the stock pickups aren’t cool, but could you imagine a Seymour Duncan Alternative 8 or a DiMarzio D-Sonic in there? Phwoar. You enter a room. On a guitar stand in the corner is this new offering from Taylor. It’s an extremely attractive, maybe even a little alluring, but otherwise regular acoustic guitar. As you get closer to it you notice that it’s a little bigger than you’re expecting. You realise that’s because it has a 27″ scale length. Interesting. Must be a baritone. Or maybe you’re shinking. You look a little closer and see that appointments include a Grand Symphony body, Indian Rosewood back and sides and Sitka Spruce top. Inlays are an elegant set of abalone diamonds, nicely complemented by abalone inserts in the bridge pins. Something looks a little odd about those pins, but it’s not until you reach out with a trembling hand, pick it up and bring it close to inspect the headstock that you realise, good lord, this thing has eight tuning pegs, yet the neck is only wide enough for six. Maybe you’ve crossed into a parallel universe. Maybe it’s a trick of the light. Or maybe you’ve just entered… the 8-string Baritone Zone. Check it out. Grover Rotormatic tuners with an improved higher 18:1 ratio gearing. Mahogany body. Maple fretboard. Seymour Duncan SJAG-1 pickups. Three-piece mahogany neck with carbon fiber rods for reinforcement. TonePros bridge system with custom brass saddles. Stars and moons inlays. 24 Jumbo frets. 30″ scale length. Want! I spent quite a bit of time geeking out over Taylor at NAMM (look for a photo special soon, and I’m taking the factory tour tomorrow! ), and one of the coolest products I saw was this incredible Baritone 8-string acoustic. Tuned B to B, the middle two strings are doubled an octave higher for subtle 12-string effects. I spent a bit of time playing it and I found it quite intuitive: because only two strings are doubled, you don’t get that same ‘I’m playing on a cheese grater … I prolly shouldn’t be doing this’ feel you get from a full 12-string. Now, as someone who plays a lot of 7-string, I can really see this guitar fitting quite nicely indeed into my recordings, adding some punch to the low end and some zing to the top at the same time. Another awesome thing about this guitar is that while I was playing it, John Petrucci strolled in to the Taylor booth. He remembered me from our recent interview (at least he said he did – maybe he was just being polite. Man that dude’s nice), and I showed him the guitar and told him how freaking awesome it is. Who knows, maybe he’ll pick one up and work it into some future music? 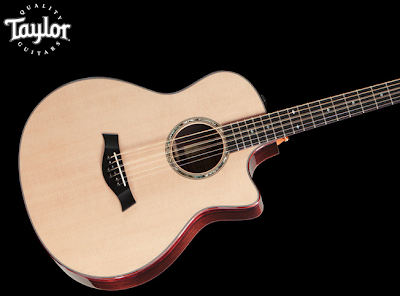 ANAHEIM, Calif. – January 14, 2010 – Born from a love of tone and a passion for innovation, Taylor Guitars has expanded the possibilities of guitar voicing in its new model, the Baritone 8-String. With a bold, fresh sound, the Baritone 8-String broadens the tonal spectrum, giving players a rich musical palette that promises to uncork new inspiration of musical harmony. Featuring a Grand Symphony body with a richly hued back and sides of Indian rosewood topped with Sitka spruce, the Baritone 8-String embodies the spirit of a traditional baritone guitar paired with Taylor’s quality craftsmanship and product innovation. The model features a longer-scaled 27-inch neck and Taylor-designed baritone bracing. The guitar is tuned from B to B and features additional octave strings paired along with the third and fourth (D and A) strings. This feature gives players an extended range of sounds, without compromising tonal integrity or playability. As enchanting as the guitar is to play and listen to, it’s equally attractive visually. The model’s appointments include a mother-of-pearl peghead inlay and delicate diamond-shaped fretboard inlays, a three-ring abalone rosette, and abalone-dotted bridge pins. Premium features include Indian rosewood binding, a bone nut and saddle, and an all-gloss finish. Amplified with the Taylor Expression System® pickup and strung with ELIXIR® Baritone strings, the model is also offered in a standard 6-string version. Available at authorized domestic and international Taylor dealers in mid-winter, the Baritone 8-String will be offered at a suggested retail price of $3,998 and the Baritone 6-String at $3,798. Players looking to keep their baritone guitar equipped with ELIXIR strings® can purchase them through TaylorWare, the company’s online store of Taylor-branded clothing, accessories and gear. To experience the company’s new guitars, artist performances, or to learn more about Taylor Guitars, please visit the Taylor Guitars booth on the second floor of the Anaheim Convention Center, Room 213.